Draft legislation that proposed a new type of mayor for Dublin had previously made it to the committee stage in late 2010 before being shelved. Yesterday's launch of the Action Programme for Effective Local Government. THERE HAVE BEEN mixed reactions to the announcement that Dublin may still get a directly elected mayor in its future. 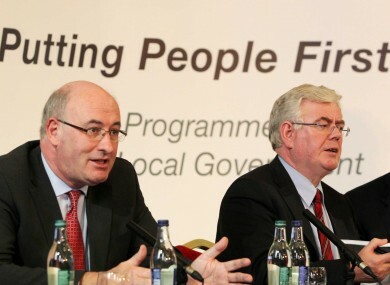 The possibility was given a new lease of life with the release of the Action Programme for Effective Local Government yesterday, which included plans to hold a vote in 2014 on whether Dubliners want a directly elected mayor. The Government has considered the potential benefits and other issues associated with this concept and has concluded that there are, in principle, potential benefits associated with the concept. Referring to a consultation with local councillors from around the country in June 2012, 51 per cent of respondents were in favour of a directly elected mayor, “citing benefits such as improved accountability, leadership and enhancement of the position of elected members”. Thirty-nine per cent were not in favour, listing things such as the cost, the addition of another tier of governance, and the need for radical reforms to local government as reasons. These percentages, however, are based on the responses of 350 councillors – a response rate of just 21.5 per cent. The proposed plebiscite [vote] is now due to take place in 2014, which is when the next local elections will take place and when other reforms in the Action Programme are scheduled for implementation … in advance of the plebiscite, due consideration will be given to the matters to be put for decision in the plebiscite … this will include the establishment of a colloquium of the elected representatives of the four Dublin local authorities to be convened by the Lord Mayor of Dublin. Work in relation to these and other proposals in the Action Programme will proceed as quickly as possible. This plan fails Dublin by lumping the city into a wider regional authority. Had the directly elected Mayor been introduced last year as had been legislated for, we would already have an office up and running with real powers to co-ordinate transport and land use planning in the city. We argued for many years for the creation of a post of directly-elected Mayor for Dublin, to tackle the major strategic challenges facing the Dublin Region and with the following powers. However, to be effective that Mayor needs to have the power to drive real change and without that commitment the special forum is a pointless exercise. The worst case scenario for business, workers, residents and visitors to Dublin would be to continue with the current system of a Mayoral office with no powers. I welcome the decision that a plebiscite will be held in 2014 on the creation of a directly elected Mayor for Dublin. It will give citizens of our capital a say in their future and ensure a decision is not forced onto them. This reform will be delivered through democracy. In addition to an elected mayor having more power, many also believe that the current one-year term does not give current mayors enough time to make any real changes. Email “Directly elected mayor still a possibility for Dublin - but not before 2014”. Feedback on “Directly elected mayor still a possibility for Dublin - but not before 2014”.